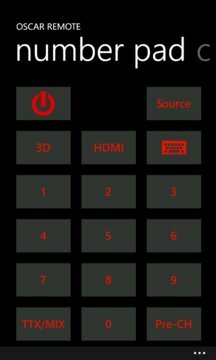 Turn you Windows Phone into a remote control for Samsung Smart TV’s. Connect your phone to the same local area network as you TV and the auto discovery will find all TV’s on the same network. The remote control offers you the same control you have with your TV remote. Using the phones keyboard you are also able to enter text such as search or the browser address bar (Please note this may not be supported on all apps). Auto discovery uses Universal Plug and Play UPNP; if your Wi-Fi router does not support this you are still able to manually add your TV’s IP Address and use the remote. Within the application you are able to pin your TV’s to the start menu allowing you to directly connect to your TV. While the application offers you the ability to turn your TV off please note it is not possible to turn your TV on with this application. For feedback and feature request please send email to oscarremote@lyzard.co.uk, if you encounter any problems with your particular TV model please send feedback with your TV Model year of manufacture and problem identified.